The oak woodland landscapes that it calls home have diminished, pesticide use has increased and three years ago, the West Nile Virus wiped out almost half of its population. But Californians love this dynamic state native, and their devotion was evident when the yellow-billed magpie was voted Audubon California’s first bird of the year in 2009. The quirky, white, blue and black bird with the bright yellow beak lives in California’s Central Valley and along the Central Coast, and it only lives within the state. “As Californians, it’s our bird, and it could really benefit from us knowing more about it and taking care of it,” said Graham Chisholm, executive director of Audubon California. By honoring the yellow-billed magpie, which is a member of the crow and raven families, the bird lovers in California sought to recognize this species’ story and raise conservation interest. 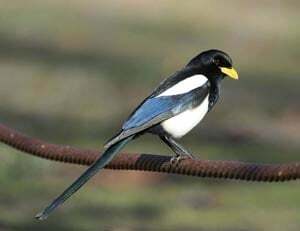 The yellow-billed magpie is a familiar sight in Buellton, the Santa Ynez Valley and the rural areas east of Santa Maria and southern San Luis Obispo County, according to Andrea Jones, Audubon California’s director of important bird areas program, based out of Morro Bay. “For some reason, this bird just adapted to live in California, specifically the oak woodlands,” Jones said. According to Audubon California, the eye-catching bird with the funny walk began declining at a steady pace from 1995 to 2003. The total number of magpies was estimated at 180,000 when they were hit by the West Nile Virus, a disease spread by mosquitoes. The virus wiped out between 22 and 42 percent — approximately 39,600 to 75,600 birds — through 2006, according to Audubon California, a nonprofit organization focused on protecting birds and their habitats. “Being a bird that’s endemic (exclusive to California), we can’t just say, well it’s having a hard time here, but maybe it’s doing fine somewhere else,” explained Jones. “We think they’re rebounding,” Jones added, “but don’t know if it’s throughout (the bird’s) whole region,” which spreads from Sacramento to Bakersfield and west to Santa Barbara and San Luis Obispo counties. In an effort to learn more about the magpie and whether it’s making a comeback, Audubon California conducted a pilot survey this year across California counties to identify the bird. The organization is hoping to expand its efforts in next year’s survey. The yellow-billed magpie beat out the California condor, the brown pelican, the western snowy plover, the peregrine falcon and the acorn woodpecker for the 2009 bird of the year honor.